Today the most attractive type of flooring is laminate. 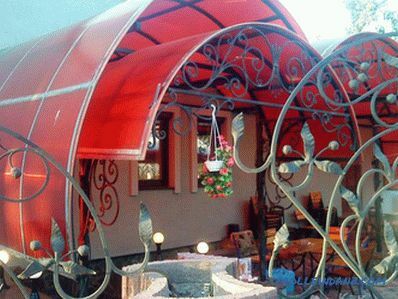 And the price of this material is affordable, and the appearance is attractive, and you can lay it yourself. Yes, and performance in many ways not inferior to natural materials. In order for the installation not to turn into disappointment, you should carefully read the features of the technology. 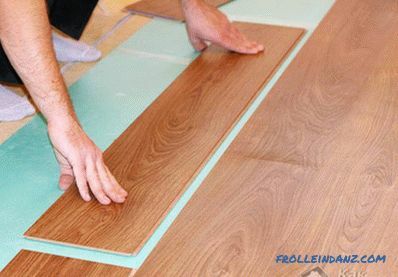 In this article we will give step by step instructions for laying laminate. The first step in working with laminate is This is a surface check for overshoot. 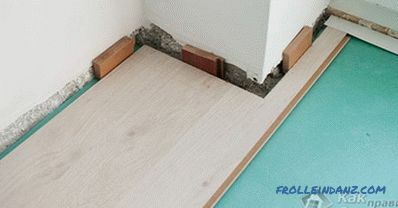 In case of floor drops of more than 2 mm per m 2 , the surface must be evened out. This can be done with the help of finishing self-leveling mixtures. It is easy to work with them, they dry out within 24 hours, however this method is suitable only for differences that slightly exceed the norm. If there are large slopes and elevations, then you can not do without screed. Another base for laminate flooring may be a plywood floor. Plywood can be started up both on the screed and on the logs. After leveling the floor surface to the same height level, you can proceed directly to work. laying kit (it includes wedges and a tamping block). You can save a little and use instead of a tamping kit, laminate trimming, which will remain during installation. 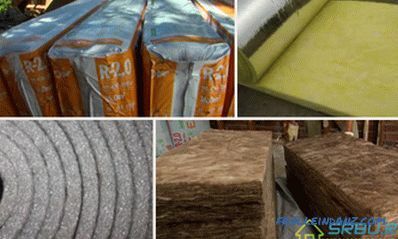 Consumables - this is a common plastic film that serves to waterproof the screed, counterfeit material, adhesive tape and waterproof putty or sealant. 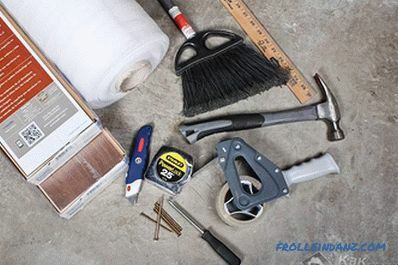 Since you can’t do without installing baseboards after installation, you will additionally need a hammer drill or a hammer drill, and you will need a block to cut 45-degree corners. First you need to calculate the amount of laminate. It would seem, it is already possible to start installation. But first you need to make sure that the screed is dry. To do this, there is a proven old-fashioned way: a piece of film is laid on the floor, which is glued with tape along the perimeter to the screed. If condensation comes out in the morning, the screed has not dried yet. In addition, it is necessary to check the tie for the presence of cracks - the base of the tree should not creak or be movable. The laminate must be dried and allowed to rest. For this, it is placed for several days in a room with a temperature of at least 18˚С and humidity of not more than 75%. When everything is dry, you can cover the floor with a waterproofing film and lay a false material over it. The sheets of the substrate are placed end to end to each other, after which the joints are sealed with masking tape. Scotch taping facilitates subsequent work, as it prevents sheet displacement during laying. Usually, the laminate starts to be laid with far left corner of the room, with the installation being carried out along the direction of sunlight or along the longest side of the room. For maximum accuracy, a cord is fastened parallel to the wall and, guided by it, is aligned. In the case of curvature of the wall, the first row is cut along the contour of the bend. Planks are placed with a crest to the wall, joining the boards with their ends. 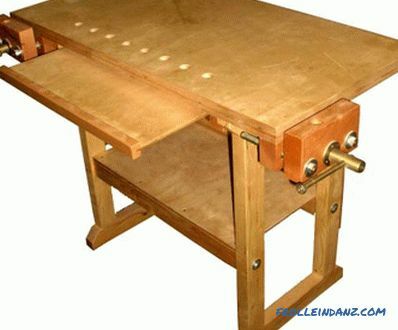 Here it is necessary to mention that there are two systems for laying laminate: glue and lock. The advantage of the castle system is that the coating can be put on a warm floor (only with water heating), it is somewhat cheaper and simpler. 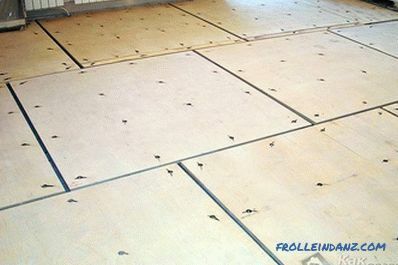 But the glue system prolongs the life of the floor for at least a few years due to the greater tightness of the coating. In any case, when adjusting the bars, you need to remember that you should hammer with a hammer directly they can not. All fitting should be done through a block or just a wooden block. Reaching the last bar, you need to measure, do not forget about the technological gap, and then cut off the bar of the required length. Most impressive laminate flooring looks when panels are taken apart. 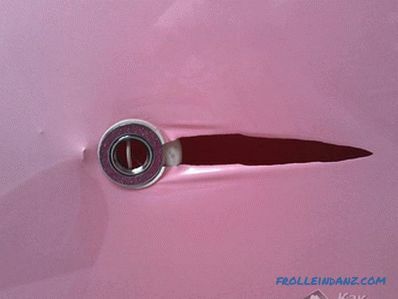 Yes, and the end seams with this method of assembly become less noticeable. 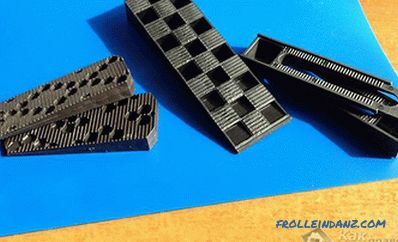 The most economical way to achieve this effect is to use the second row as the first board, the remaining trim from the first. It should be borne in mind: if the length of the trimming is less than 20 cm, then its application will give rather negative visual effect. The floor gets the optimum appearance when you run to the third of the board. Unfortunately, if we purposefully cut off the third part of the panel for laying a new series, then a significant increase in material consumption is inevitable. 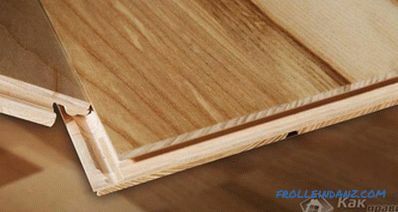 The second and subsequent rows of the laminate are laid as follows: at an angle of 20-30˚, the ridge of the panel is inserted into the groove already laid, and then slowly aligned on the substrate. After the second row has been laid, a technological gap is established. It is located between the wall and the laid cover, and its width must be at least 8 mm. This distance is provided by the installation of pre-prepared wooden wedges, and its main purpose is to enable the laminate to "breathe." With the same purpose, a large 20 mm wide technological seam should be made in the middle of a room in a large room. Subsequently, he covers the decorative strip. The important point is that the styling takes place in a “floating” way. That is, the panels should in no case be nailed or glued to the base. Baseboards fasten to the walls, but not to the floor. The most difficult may be laying the last row. However, this will happen only if the distance between the last but one row and the wall is insufficient to put another row of panels. Then you have to cut laminate boards along the length in accordance with the contour of the wall and the remaining uncovered area, taking into account the technological seam. In the case of a locking installation system, the floor is ready for use almost immediately. It is only necessary to cut the excess protruding film and the substrate, as well as to mount the baseboards and decorative strips. 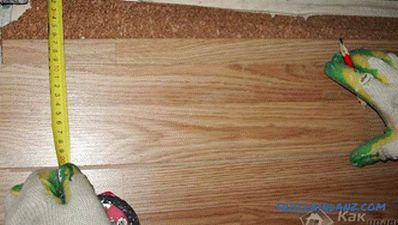 If the laminate is laid on the glue, then until the moment when it will be possible to walk on the coating, it should take at least a day. Also You can lay the laminate in a somewhat unusual way - diagonally. Material consumption will increase by 5-15%. This indicator is not a constant value, since the lamellas have to be customized in different rooms, and the amount of waste depends on the piece to be cut. The optimum angle of the flooring is considered to be 45º, since the minimum amount of waste remains and the best visual effect is achieved. If you need to do something else, then deviation is allowed when laying no more than 30º. The lamella fit algorithm is practically the same. 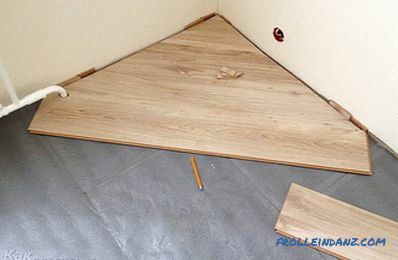 The floor preparation has already been written and there are no differences here, so immediately proceed to the choice of the angle from which the installation will begin. If the direction of the seams is not important for you, but you don’t need to choose a color or pattern, then it’s best to start from the corner where heating pipes or other communications go - so you will save yourself from tedious lamella fit at the final stage of paving. In order to properly cut the lamella, you will need a corner or a piece with a preselected cutting angle. A common cause of material overruns is the error in marking the slats and cutting them in the wrong direction. It is quite clear that each new row will have to be customized, cutting to size. The work is painstaking, requiring utmost care and concentration. 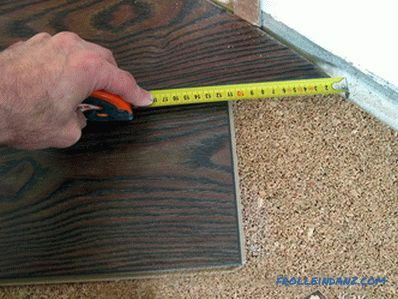 If the first time you lay laminate diagonally, it is best to carefully measure and adjust each panel. 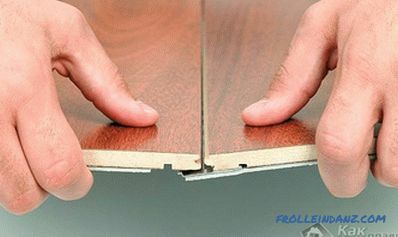 It is also important to know that most of the segments can be used when installing the coating on the second half of the room, when the direction of the cut will change.